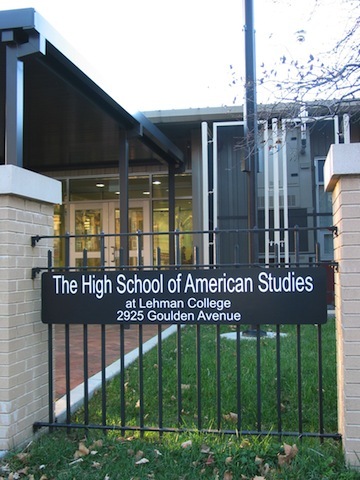 The High School of American Studies at Lehman College has been named the #1 public high school in New York State by U.S. News & World Report. The Bronx school was ranked #32 in the nation. The High School of American Studies specializes in American history, and offers Advanced Placement courses in English, calculus and chemistry. To supplement in-class learning, students travel to historical sites and attend seminars with guest speakers. Juniors and seniors at HSAS can enroll in courses at Lehman College, and all students are encouraged to embark on individual research projects. The High School of American Studies has a 100 percent participation rate on Advanced Placement tests and a passing rate of 94 percent. See the full overview from U.S. News & World Report. The High School of American Studies has a student body of 385 and 25 full-time faculty, creating a student-to-teacher ratio of 15:1. Students are admitted by competitive exam, and reflect a wide racial and ethnic diversity. Nearly half are minority students and nearly a third hail from disadvantaged backgrounds. The school was founded in 2002 through a collaboration among Lehman College, the New York City Department of Education, and the Gilder Lehrman Institute of American History. The school has been ranked by U.S. News & World Report nearly every year of its existence. U.S. News & World Report examined nearly 20,000 public high schools in all 50 states and based its rankings on the institutions’ performance on state assessments and how well they prepare students for college.